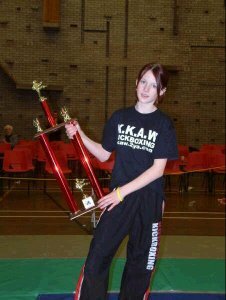 Rachel lives in Llanelli, West Wales and has been a student of martial arts since she was seven. 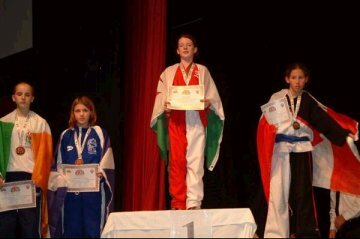 She began learning Tae Kwon Do and then changed to Korean Kick Boxing at the age of eleven. She is the current world champion for her weight and age and is known as "Ring Rat". Rachel is fast and fierce in the ring. 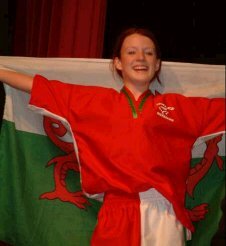 Rachel has taken part in many European competitions and has met people from all over the world. This has given Rachel the opportunity to mix and become friends with people of all races, cultures and religions. Rachel has experienced some difficulties in obtaining sponsorship because of her gender. If she were a boy there would be no problem at all. This is something Rachel wants people to know about and put right. Rachel feels very strongly about human rights and justice in the world. She hates racism and prejudice in any form and for this reason supports the Peace Mala. I like wearing the Peace Mala because of what it represents. I believe in its message for the world and I also think it's an attractive fashion item to wear.